If ever a comic added entirely new layers to the term “guilty pleasure” then it’s Richy K. Chandler’s Lucy the Octopus. The tale of a young schoolgirl cephalopod ostracised by her classmates, shunned by her siblings and put down by her parents, much of the entertainment value of the first collection lay in the multiplicity of inventive ways Chandler found to dent the self-confidence of this aquatic everywoman. 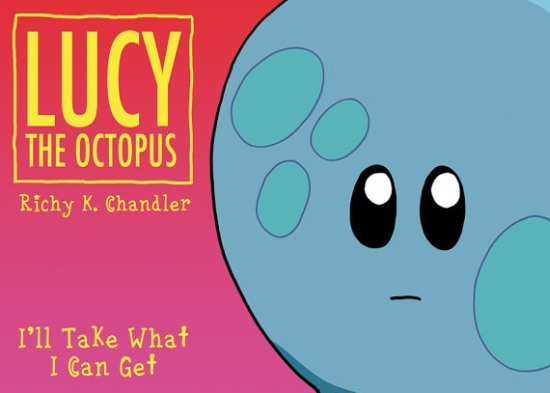 Compiled from Chandler’s popular webcomic strips the second volume of Lucy the Octopus – subtitled ‘I’ll Take what I Can Get!’ – was published towards the end of last year. This time round poor Lucy is still dodging the barbed comments of her contemporaries and once again dealing with her non-existent social standing. However, we also get to see her interacting in unexpected ways with her musical heroes pop group Lamington Fuzz, whose presence proves to be a major part of this collection. What’s instantly noticeable about I’ll Take what I Can Get! is that although Chandler is still structuring each entry in the manner of a four-panel newspaper strip there’s a far more obvious attempt to present a longer story arc here. That’s not to say that there weren’t recurring elements in terms of both characterisation and situations in the first volume Better in Small Doses but there’s far less of the one-gag arrangements here and a greater reliance on punchlines that feed into a greater ongoing plot. It’s an approach that makes sense because had Lucy remained a passive character, simply reacting (or not as the case may be!) to the spite aimed at her, the strip would have eventually begun to feel unrelentingly cruel. Here we can take some comfort in her little victories (this being Lucy the Octopus they generally really are quite small ones!) and, although deep down we know Lucy’s existence is always going to be a harrowing one, we can at least fool ourselves as readers into believing there may be some eventual respite for her. Packed with extras including a feedback competition with the readership and a mini-feature on last year’s Webcomic Artist Swap Project (of which Lucy was a major part) Lucy the Octopus #2 is a hugely accessible offering that makes a tangible effort in reaching out to and interacting with its audience. Inventive and witty, with a colourful cast of characters, Lucy the Octopus remains one of the most engaging UK originated webcomics out there. Lucy the Octopus #2: I’ll Take what I Can Get is published by Tempo Lush priced £3.50 and can be bought from the online store here. The Lucy the Octopus newspaper strip is updated weekly here. Great review, Andy! I totally agree with you about Lucy’s small victories!